While the next feature release of version 1709 is just around the corner, Microsoft is doing some last-minute tweaking to privacy settings. While Insiders are receiving the final stabilization versions of Windows 10 Fall Creators Update that contain no new features, the company is adding some last minute privacy improvements. Microsoft has received plenty of scrutiny about privacy in Windows 10 since it was launched in 2015. Since then the company has been more transparent about what it collects and has improved privacy controls in the OS over the past few years. 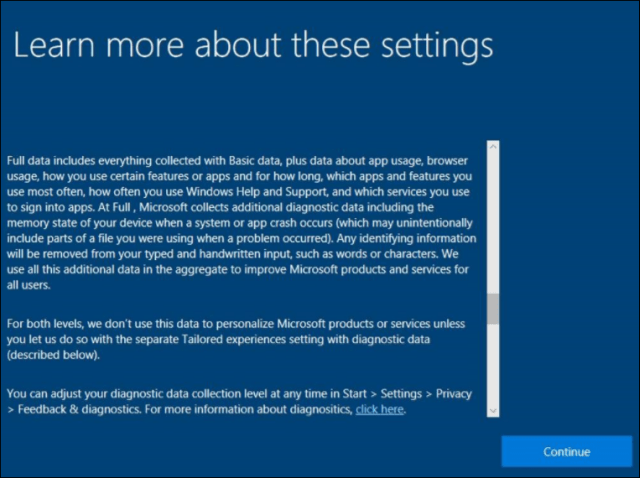 Microsoft also brought new privacy settings to the Creators Update (version 1703) which was released last Spring. Now, the company revealed it is taking more steps to enhance privacy even more in Fall Creators Update which is set to be released October 17, 2017. The announcement of new privacy enhancements was made this week. “Continuing with our commitment to privacy and data control, today we’re announcing privacy enhancements coming to the Windows 10 Fall Creators Update for consumers and commercial customers that further increase your access to information and provides you more control over what information is collected.” Microsoft’s Privacy Officer Marisa Rogers writes. The updates will let users access the full privacy statement from the company during setup. Most people never read the EULAs but there will be a “Learn More” section for each privacy setting. Another notable improvement is the Windows 10 update will introduce app permission prompts that are like the ones you see on Android and iOS. You will be prompted to give permission to an app before it can access personal areas of your device like contacts, microphone, or camera. Consumers aren’t the only ones who will have access to new privacy features. There will be enhancements for IT administrators to limit down the telemetry that’s collected to the minimum that’s required for Windows Analytics. “Our Enterprise customers asked us to provide them with greater control over which data is shared with us to enable new services,” Marisa Rogers explained. This last-minute change will provide even more user control over what data is being sent back to Microsoft servers. For more information on what Microsoft really collects from its Windows 10 users, read our article: How Much Does Windows 10 Really Spy on You? Are you worried about privacy in Windows 10 and do you agree with these latest changes that give the user more control over what is shared? Leave us a comment below and let everyone know your thoughts.